It's hard to credit any one person with the invention of the electric trolley. There were many notable people involved in one area or another. Edison and his electric motor for one, Leo Daft, who built one of the first practical electric locomotives, the "Ampere", in 1883, at 25 hp and weighing 2 tons, and Charles J. Van Depoele who built several of the early experimental lines. Frank J. Sprague, "The Father of Electric Traction" was probably the most notable, not just for one of the first practical electric trolley cars but later for the concept of MU, or Multiple Unit control. Early experiments saw some strange methods used to get power to the cars. Live rails, much like in a model railroad, were tried but it was soon found that the voltage was either to low to efficiently operate the motors or to high causing electrical shock to those who came in touch with them, especially on rainy days. Third rails were tried but here again the exposed rail was a hazard. The first cars to use a wire overhead, used a "troller" running along the overhead wire and connected to the car with a slack cable. This also turned out not practical because when the trolley stopped the momentum of the troller kept it going until the slack was taken up. Having run out of slack, the troller would jerk to a stop, often falling off the wire. Another problem seen by the early lines was with the use of the rails as the return path for the current passing through the motors. The idea of a good electrical connection at rail joints wasn't a great concern at first, causing problems not only to the cars but also to the surrounding areas. Early telephone systems would see great interference from the trolleys. As time passed these problems were resolved, the use of a trolley pole, with it's under running wheel, (and later a sliding "shoe") came into being and the boom of the trolley car was underway. 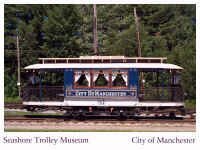 By 1887 the electric trolley was running in ten locations, over about 60 miles of track, with varying success, though there still wasn't a "standard" idea as how to build the cars. Some used motors mounted on the car, some were mounted under the car, and driving the wheels in a variety of ways. Belt drives, chain drives, gear drives were all in use and dependability was still a problem. In 1884 Frank Sprague, who had been working for Edison, started his own Sprague Electric Railway & Motor Company. His development of the electric motor was quite successful and he soon turned his full time attention to the electric railway. After a minor defeat while showing his new car to Jay Gould, in which the main fuse blew and Gould happen to be standing next to it when it let go, Sprague was able to land a contract with Richmond Union Passenger Railway, to provide a complete electric street railway system. The contract called for twelve miles of track, a steam-electric plant of 375 hp and forty cars with 80 motors. This was nearly as many motors as were being used throughout the country at the time. The line was to be capable of running as many as thirty cars at one time and on grades up to eight percent. For this he was to be paid $110,000 "if satisfactory". The track work was contracted out and was poorly done. There was some doubt that the two, seven horsepower motors with single reduction gears could handle the tasks on the steeper grades so a change was made to double reduction gears. This should take care of any question of torque but there was still the fear of losing traction on the grades. On a dark night in November of 1887 Sprague set out to see if the car would climb the grades. Though he had success in getting up the hill the motor did short out and the car had to be hauled back using mules. More gearing was added to ease the load on the motors. Problems were also apparent with the type of trolley pole he was using but after many attempts this also was resolved. February of 1888 saw the opening of the line, though only ten of the cars were on hand. While the cars did pretty well electrically, at first, there were mechanical problems with the gears, though most was due to improper lubrication. The motors also proved to be not very dependable and were constantly shorting out, resulting in the need to ship them back to New York for rebuilding. The motor brushes, being made of brass, were wearing out at a tremendous rate, often needing replacement during a trip. Improvements were made and the trouble lessened as time went on and soon all forty cars were in Richmond. In the mean time, the original operating syndicate in Richmond had gone bankrupt and was taken over. When it was all over Sprague estimated that it cost him $75,000 more than he was paid. But the great success of the railway paved the way for future work. Owners of horse car lines from all over the country came to see Sprague's electric railway. Most notable among them was Henry M. Whitney, president of the West End Railroad in Boston. 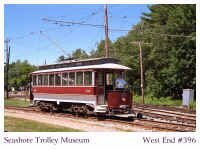 (The West End Railway was one of the country's largest horse car systems) While the general manager of the West End Railway favored a cable system, Whitney was impressed with the electric cars. Longstreet, West End's general manager felt that the trolley couldn't work in a congested city because the trolleys were apt to bunch up and when this happened it would overload the system. To demonstrate the system and more importantly to satisfy Longstreet, Sprague set out to line up twenty two of the trolleys, one behind the other, and shortly after midnight, with his guests watching he gave the signal to start. Each car pulling away as soon as it had safe headway from the car in front of it. Certainly a strain on the system, but all cars were soon out of sight. Sprague went on to explain that this area of the sys tem was designed to handle only four well spaced cars. Sprague ended up getting the Boston contract. Until now the electric trolley hadn't threatened the horse car lines and cable lines in the big cities but that was all about to change.